Thanks for the reminder of the "Wrecking Crew", of which Earl Palmer was one the original members. They were the "go-to" musicians for many artists & producers. Netflix had a great documentary about them (very informative) and it might still be available for streaming. Just do a search for "The wrecking Crew"
The drummer / percussionist for Warner Bros. cartoons was an unheralded unknown (to the general public) named Earl Palmer. This legend among musicians was a highly in-demand session drummer in the 1950's-60's. In his autobiography he says that of all the gigs he played, cartoon music was by far the most challenging. You could never relax because you couldn't anticipate anything! All the rhythmic change-ups, unpredictable stops, starts, accents, sound effects. The drummer did it all. Everything was written out and you were expected to sight-read it in one take! Nobody in that highly paid profession could survive if he wasn't a super excellent sight-reader (you never got a call-back). Incidentally, Earl Palmer was the studio drummer on most of the pioneering rock and roll records we know and love: Shirley and Lee, Little Richard, Larry Williams, Fats Domino, etc., etc. That's him. Thank God for YouTube...My favorites are "Foghorn Leghorn" and "Sam and Ralph"! was made for a family audience. 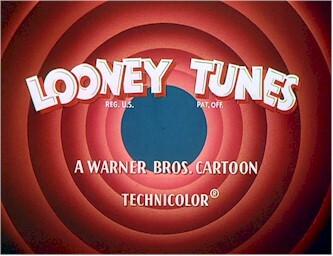 I watched the "Looney Tunes" and "Merrie Melodies"
Herb Sheldon and Chubby Jackson on WOR TV Ch.9 in NYC. "It's curtains for you Rocky, ya hear, curtains." "No, no, Bugsy, don't do it. Don't do it." Agreed, the cartoons were made for adults, but I guess it took the programmers years to realize that they weren't for kids. WB cartoons were smart, funny, and well-written. There's nothing to compare to them today. I'm glad to have grown up with them. Greatest 'toons ever... Hilarious running jokes like ACME and Wile E... "ACME Superman suit, guaranteed for the life of the user!" Most of the classic Bugs Bunny cartoons (1940's - 1950's) were NOT written for children. They were shown as "cartoon shorts" that accompanied theatrical releases in movie theaters. That is why the humor is more adult-oriented than you would think. THE most adult (grown-up, not necessarily sexual, but some) oriented cartoons EVER. Shown every Saturday morning until banned by the current day P.C. authorities until after 10:00 P.M.